If you are new to Reformed theology and are anything like I was, then you probably have questions about theological terms and abbreviations. I hope the following list helps! You can also contact me (Pastor Aaron) with your questions. a cappella – music without the accompaniment of instruments. This was the universal practice of the early church for hundreds of years since the Apostles; it is also the practice of the RP church. For the biblical basis of a cappella singing in public worship see: John Price, Old Light on New Worship and Dennis Prutow, Joyful Voices: A Capella Singing in Congregational Worship. ARPC – Associate Reformed Presbyterian Church. A member of NAPARC, with a membership of about 40,000 and just over 250 churches; located mostly in the Southeast. Their denominational magazine is The Associate Reformed Presbyterian. Baptism – Baptism is a sacrament, wherein the washing with water in the name of the Father, and of the Son, and of the Holy Ghost, (Matt. 28:19) doth signify and seal our ingrafting into Christ, and partaking of the benefits of the covenant of grace, and our engagement to be the Lord’s. (Rom. 6:4, Gal. 3:27). Baptism is not to be administered to any that are out of the visible church, till they profess their faith in Christ, and obedience to him; (Acts 8:36–38, Acts 2:38) but the infants of such as are members of the visible church are to be baptized (Acts 2:38–39, Gen. 17:10, Col. 2:11–12, 1 Cor. 7:14) (Questions 94 and 95 of the Shorter Catechism). The Blue Banner. This is the logo of the Reformed Presbyterian Church of North America. Blue book – the Constitution of the RPCNA. Contains our beliefs and practices. A copy of the “blue book” can be found by clicking here. Board of Education and Publication – uses the medium of print to promote, encourage,and defend the Reformed faith and testimony of the denomination. Publications include The Reformed Presbyterian Witness, our monthly denominational magazine, and other praise and testimony materials including The Book of Psalms for Singing. Christian Reformed Church (CRC) – “was brought to North America by those who belonged to a more orthodox Reformed denomination in Holland. As more recent immigrants (from the late 19th century to the present), CRC members were generally much less aware of, much less infatuated by, American evangelicalism (i.e., revivalism). However, that is changing and the CRC now accepts contemporary worship styles, controversial church growth programs and the ordination of women to all offices” (Michael Horton, “Finding a Church”). close communion – the former practice of the RP Church in forbidding from the Lord’s table all who were not members of the RP Church; the practice was later changed to “session controlled communion”. communicant member – a member of the church who takes communion. Baptized children in the RPCNA are considered members (baptized member) but they cannot partake of communion until they make a public profession of faith and are admitted to the Lord’s Table by the session (see Question 177 of the Larger Catechism). Constitution – The beliefs of the RPCNA. The Constitution contains: The Westminster Confession of Faith, the Larger and Shorter Catechisms, the Testimony, the Directory for Church Government, the Book of Discipline, and the Directory for the Worship of God. A copy of the RPCNA constitution can be found by clicking here. covenanter – On special occasions in both the Old and New Testaments, believers covenanted together that they would obey the Lord. At the time of the Reformation, believers in Scotland adopted this practice for mutual protection and the advancement of Biblical Christianity. On at least three occasions: 1581; 1638, and 1648 – the entire nation covenanted this way. These covenants embraced the whole orb of Christian faith and experience, emphasizing such great themes as repentance, grace, and obedience. They also maintained that the King (or the State) cannot govern the Church, and that the State itself must recognize the supreme kingship of Christ. The Reformed believers, known as Covenanters (from their support of the covenants), insisted on “the crown rights of King Jesus,” which brought them into conflict with those who supported “the divine right of Kings.” A good place to learn more about covenanter history is the article Covenanter in Wikipedia and J.G. Vos, The Scottish Covenanters. 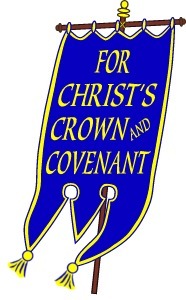 Covenant of 1871– sworn/subscribed by Synod of RPCNA in Pittsburgh;the covenant consists of (1) confession of personal, ecclesiastical, and national sins (2) rejection of things contrary to God’s Word (3) promotion of God’s Word to unite the Church and bring submission of the government under Christ. The doctrine of the Covenant lies at the root of all true theology. It has been said that he who well understands the distinction between the Covenant of Works and the Covenant of Grace is a master of divinity. I am persuaded that most of the mistakes which men make concerning the doctrines of Scriptures are based upon fundamental errors with regard to the covenants of law and the covenants of grace. elders – Those men who are called by God, elected by the congregation and approved by the Session or presbytery to oversee God’s people in a particular congregation. L’Église Réformée du Québec (ERQ) – Officially established on November 6, 1988. The majority of its members are French-speaking Québecers. Their officially adopted creeds are the Heidelberg Catechism and the Westminster Confession of Faith. exclusive psalmody – view that only the psalms are to be sung in worship. For the biblical rationale behind this see: Michael Bushell, Songs of Zion: A Contemporary Case for Exclusive Psalmody, 4th Ed. Global Mission Board – responsible for all aspects of the foreign missions of the church, including oversight of missionaries, budgets and salaries, keeping the church aware of needs in the mission fields, and investigating new fields of opportunity. Geneva College – founded in 1848, is a fully accredited Christian college of approximately 1,200 students operated by the RPCNA. It is located on a 55-acre campus overlooking the Beaver River. Home Missions Board– provides counsel, encouragement, resources, training, and support to the presbyteries as they do the work of church-planting. In consultation with the presbyteries, this board also determines the level of financial support that each of the new works will receive. Korean American Presbyterian Church (KAPC) – one of the members of NAPARC. They take a conservative stand on Scriptures but “with considerable latitude in worship and the interpretation of Reformed distinctives” (“Finding a Church”, Michael Horton). Lord’s Day – The Christian day of rest (Ex.20:8-11; Isa.58:13-14), observed on the first day of the week because of the resurrection of Jesus from the grave on that day. Mediatorial Kingship of Christ – distinctive of the RPCNA. The rule and reign of Christ as Mediator. It is the belief that Jesus is Lord of individuals AND nations (Psalm 2:7-12; 110; Mt.28:18; 1 Cor.15:25-28; Phil.2:9-11; Eph.1:19-23; Rev.1:5,6). Two classic works on this doctrine are William Symington’s Messiah the Prince and Alexander McLeod’s, Messiah, Governor of the Nations of the Earth. Mission Church – a Church that has only one resident elder. It differs from an organized Church in that it cannot elect elders. NAPARC emphasizes an adherence to historic Reformed creeds and promotion of truthful unity of the body of Christ. Their purpose statement is: Confessing Jesus Christ as only Savior and Sovereign Lord over all of life, we affirm the basis of the fellowship of Presbyterian and Reformed Churches to be full commitment to the Bible in its entirety as the Word of God written, without error in all its parts and to its teaching as set forth in the Heidelberg Catechism, the Belgic Confession, the Canons of Dordt, the Westminster Confession of Faith, and the Westminster Larger and Shorter Catechisms. That the adopted basis of fellowship be regarded as warrant for the establishment of a formal relationship of the nature of the council, that is, a fellowship that enables the constituent churches to advise, counsel, and cooperate in various matters with one another and hold out before each other the desirability and need for organic union of churches that are of like faith and practice. National Reform Association (NRA) – formed in 1864 as a means of promoting a Christian amendment to the Constitution, the mission of this organization is to maintain and promote in our national life the Christian principles of civil government, which include, but are not limited to, the following: 1) Jesus Christ is Lord in all aspects of life, including civil government. Jesus Christ is, therefore, the Ruler of Nations, and should be explicitly confessed as such in any constitutional documents. 2) The civil ruler is to be a servant of God, he derives his authority from God and he is duty-bound to govern according to the expressed will of God. 3) The civil government of our nation, its laws, institutions, and practices must therefore be conformed to the principles of Biblical law as revealed in the Old and New Testaments. Their publication is the Christian Statesman. Ordained Servant – OPC journal for ordained church officers. Orthodox Christian Reformed Church (OCRC) – left the CRC because of the CRCs departures from Reformed and biblical theology. Orthodox Presbyterian Church (OPC) – founded in1936 by J. Gresham Machen. They broke off from the PCUSA because of the PCUSA’s weak view of the authority of Scripture and rejection of significant doctrines such as the virgin birth of Christ. As of 1987 they have over 18,000 communicant members in approximately 175 congregations. Ottawa Theological Hall (Ottawa, Canada) – was established in 1982 under the oversight of the St. Lawrence Presbytery. A Master of Divinity program is offered. precentor – the person who leads singing. presbyter – literally, an elder. Presbyters are officers of the New Testament Church, of two classes: 1. Those who rule (“ruling elders”); 2. Those who in addition to ruling also teach and preach (the minister or pastor). Presbyterian Church in America (PCA) – Came out of the PCUS (Southern Presbyterian Church). The World Almanac and Book of Facts for 2004 estimates their membership at 306,784 members among 1498 congregations. The PCA is a member of NAPARC. Presbyterian Church (USA) – The “mainline” Presbyterian Church. The World Almanac and Book of Facts for 2004 estimates it as having 3,445,952 members among 11,142 congregations; its membership is declining. Presbyterianism – form of church government in which the church is governed by a plurality of presbyters (elders) in a series of graded courts in which the highest is a synod or general assembly. presbytery – gathering of sessions. The presbytery represents a geographical region and oversees the congregations in that region. Christ Church is part of the St. Lawrence Presbytery. The other presbyteries of the denomination are: Allegheny, Atlantic, Great Lakes-Gulf, Midwest, Pacific Coast, Japan. RCUS – Reformed Church in the United States. There are 37 churches, with a membership of just over 4,000. Strongest in the Dakotas and California. The RCUS is a member of NAPARC. Reformed Presbyterian Home – provides retirement living and nursing care for RPs and others. The goal of the home is to provide an environment that will help an individual achieve his or her maximum level of physical, spiritual, mental, and social well being. Founded in 1897, it is located in Pittsburgh, PA.
Reformed Presbyterian Witness – monthly denominational magazine of the RPCNA. regulative principle – doctrine held by Reformed Churches which says that the worship of God must be regulated by the Word of God. See G.I. Williamson, The Regulative Principle of Worship and Richard Muller; Roland Ward, Scripture and Worship. RP– abbreviation for Reformed Presbyterian. RPCNA – Reformed Presbyterian Church of North America. Reformed Presbyterians have also been referred to historically as Covenanters because of their identification with public covenanting in Scotland, beginning in the 16th century. This act was a protest for Christ’s crown rights over the state and the recognition of Christ as King over the Church without interference from the government. In 1743 the first Reformed Presbyterian congregation was organized in North America. A copy of our beliefs and constitution can be found by clicking here. RPM&M – stands for Reformed Presbyterian Ministry and Missions; the central pot for Synod’s budget for the Church. RPTS – Reformed Presbyterian Theological Seminary. Located in Pittsburgh, PA. Fifth oldest seminary in the U.S. (1810). Reformed Translation Fellowship (RTF) – Began in Manchuria, China for the purpose of providing Reformed literature in the native language. Ruling Elder – A man who has been elected by the congregation and meets the Scriptural qualifications of 1 Timothy 3:1-7; Titus 1:5-9; 1 Peter 5:1-3. Ruling elders are active in the general oversight of the congregation. The Ruling Elder of Christ Church is George Goerner. semper reformanda – Latin for “always reforming”. No Church has absolutely arrived at the truth but must continue to reform according to the Word of God. session – the elders of a particular Church (including the pastor). session controlled communion – communion that is administered by the Session and offered only to those who are known by the Session to be committed to Christ in faith and life. sola fide – Latin for “faith alone”. Teaching that salvation is received through faith alone (Eph.2:8-10). The learn more about this important biblical doctrine watch the video “Faith Alone” by RC Sproul. sola gratia – Latin for “grace alone”. Salvation is by grace alone (Eph.2:8-10). sola scriptura – Latin for “Scripture alone”. Fundamental tenant of the Reformation teaching that the whole counsel of God concerning all things necessary for God’s glory, man’s salvation, faith and life is set down in Scripture (see 2 Timothy 3:14-17; Hebrews 1-6). The anvil is unharmed—the hammers gone. strict subscription – belief that a person must agree 100% with the Westminster Confession of Faith. The RPCNA does not hold this view. Synod – The meeting of all the presbyteries. Teaching Elder – A man who has been elected by the congregation and meets the Scriptural qualifications of 1 Timothy 3:1-7; Titus 1:5-9; 1 Peter 5:1-3. The Teaching Elder is also the pastor/minister of a congregation.The Teaching Elder of Christ Church is Aaron Goerner. TFY – Theological Foundations for Youth. Annual ministry of the RP seminary and YMCS dedicated to equipping young people for a life of ministry to Christ in the RPCNA. Three Forms of Unity – the Belgic Confession, the Heidelberg Catechism and the Canons of the Synod of Dort. United Reformed Churches in North America (URC) – was founded in 1996 as an effort in part to unite churches of the Reformed confession and to reach out to non-Dutch communities (“Finding a Church” Michael Horton). Their doctrinal basis is the Three Forms of Unity. This federation of congregations is a member of NAPARC. YMCS – Youth Ministry Committee of Synod. Seeks to encourage RP presbyteries, their local congregations and the covenant parents within them to instruct the next generation of the Church to “keep the way of the LORD, to do righteousness and justice, that the LORD may bring to us what He has spoken” (Genesis 18:19). YMCS is also responsible for TFY. Westminster Confession of Faith (WCF) – the definitive statement of Presbyterian beliefs, finished in 1646. It is the last of the classic Reformed confessions and perhaps the most influential in the English-speaking world. It has been widely adopted (sometimes with amendments) by many Congregational and Baptist churches. There never has been a period in which the Christian Church has been without a Confession of Faith, though these Confessions have varied both in character and in extent. The first and simplest Confession is that of Peter: “Thou art the Christ, the Son of the living God.” That of the Ethiopian treasurer is similar, and almost identical: “I believe that Jesus Christ is the Son of God.” This Confession secured admission into the Church; but without this, admission could not have been obtained. It was not long till this simple and brief primitive Confession was enlarged; at first, in order to meet the perverse notions of the Judaizing teachers, and next, to exclude those who were beginning to be tainted with the Gnostic heresies. It then became necessary, not only to confess that Jesus Christ was the Son of God, but also that Jesus Christ was come in the flesh, in order to prevent the admission, and to check the teaching, of those who held that Christ’s human nature was a mere phantasm or appearance. Westminster Larger and Shorter Catechism – After the Westminster Assembly completed its work on the Confession, it focused its attention on preparation of a catechism. A consensus developed that two catechisms would be needed, “one more exact and comprehensive, another more easier and short for new beginners.” The Larger was intended for pulpit exposition, while the Shorter was intended for the instruction of children. These were completed, the Shorter in 1647 and the Larger in 1648. Both function as official standards of doctrine in many denominations today [including the RPCNA] within the Reformed tradition (John Frame, Elwell Evangelical Dictionary). that is might be seen by all and defended. White Lake Camp – a ministry of the Atlantic & St. Lawrence Presbyteries of the Reformed Presbyterian Church of North America. Women’s Missionary Fellowship (WMF) – encourages women in prayer, evangelism, service and changed personal lives.